The GE1 grips are designed to fit the wide handlebars on gravity and enduro bikes. A vibration damping inner core and outer rubber compound enhance comfort while you're tackling the trail. 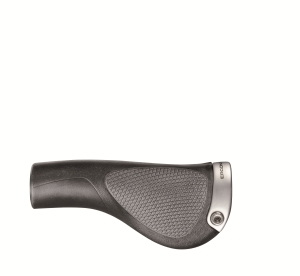 GP1 series of grips offer maximum comfort and the best possible pressure distribution. Forged alloy clamp for fast and secure installation. Grip angle infinitely adjustable. For use with Grip Shift. 95mm.